How to record a buy transaction? How to record a sell transaction? How to record received dividend? 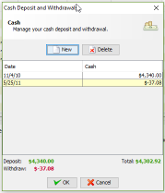 How to record cash deposit and withdrawal? Is there any way to generate dividend information automatically? Which stock gives me the best return of investment? Which stock gives me the best dividend payout? I want to know my current portfolio performance summary. I want to keep track my portfolio performance over time. How can I handle stock split/ stock merge? I can't see stock name. Can JStock display my foreign shares value in local currency? I wish to record broker fee. Can JStock auto calculate all my transaction? UK stock market price is in pence, but I want my portfolio in pound. Click on Buy... with icon , which is located at the bottom of Portfolio Management page. A Buy Dialog will be shown. First, select stock you want to sell from Buy Portfolio area. 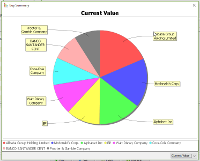 Click on Sell... with icon , which is located at the bottom of Portfolio Management page. A Sell Dialog will be shown. Click on Dividend... with icon , which is located at the bottom of Portfolio Management page. A Dividend Dialog will be shown. Click on Cash... with icon , which is located at the bottom of Portfolio Management page. A Cash Deposit and Withdrawal Dialog will be shown. 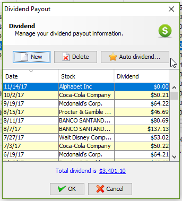 After launching dividend dialog box, click on Auto dividend... with icon . An auto dividend dialog will be shown. The suggested dividend information might not 100% accurate. You might revise them later, by specifying the dividend tax and tax rate. A Summary Chart will be shown. A Dividend Chart will be shown. From the bottom right drop down list, you may select to view total stock dividend. You may also select to view individual stock dividend. Look at the top of Portfolio Management page, there are 4 information being carried out. Share - It tells you, what is the total current market value, of all your owned shares. Cash - How much cash you have left, after you spend them to buy shares. Amount of cash will increase, whenever you receive dividend. Paper Profit - Total current market value of all your owned shares, minus their purchase value. Realized Profit - Total sold value of your sold shares, minus their purchase value. An Investment Chart will be shown. On the top of the chart, it will tell you, "Total investment is $x. Total return is $y. Net gain/loss is $z". Kindly move your mouse over the chart. 2 yellow boxes will tell you the details of your buy and sell activities over time. 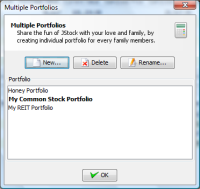 Go to top menu Portfolio-> Multiple Portfolios..., you will see the following screen. Click on New..., and key in your desired portfolio name. Select your current active portfolio by double click on the list. The active portfolio will be in bold font. You may also select your current active portfolio from top menu Portfolio. You just need to buy the stock with 0 price. You need to resize the table column. Go to Options-> Options...-> Wealth, under Currency section, you may choose your local currency. Currency exchange rate is displayed at the bottom right of status bar. You may enable the feature through Options-> Options...-> Broker. Yes. JStock can perform auto calculation on all your transaction records. Take a look on the following case, on how transaction cost is being calculated. I go to top menu Options-> Options...-> Broker, and provide the following inputs. My Broking Firm is offering me the following rate. My broker fee rate is 0.42% out of total contract value. The minimum broker fee which I need to pay is $28.00, regardless my contract value. The maximum broker fee which I need to pay is $1,000.00, regardless my contract value. For example, I buy a stock with total value $1,000.00. The broker fee I need to pay is min[ $28.00, 0.42% x $1,000 = $4.20 ] = $28.00. Stamp duty is being calculated as follow. $1.00 for $1000.00 or fractional part of total contract value. The maximum stamp duty which I need to pay is $200.00, regardless my contract value. For example, I buy a stock with total value $2,100.00. The stamp duty I need to pay is $1.00 + $1.00 + $1.00 = $3.00. 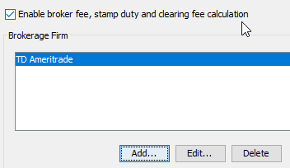 Clearing fee is being calculated as follow. 0.03% of total contract value. The maximum clearing fee which I need to pay is $1,000.00, regardless my contract value. For example, I buy a stock with total value $1,000.00. The clearing fee I need to pay is 0.03% x $1,000.00 = $0.30. JStock will perform conversion automatically, as it can detect whether a stock is traded in pence, pound or dollar. When you enter a new buy/sell transaction, the buy/sell price is in pence (cent). When you enter a new buy/sell transaction, the broker fee, clearing fee and stamp duty are in pence (cent). The displayed value is in pound (dollar).